A simple GCD based HTTP library for Swift. This project is 'pure' Swift/C, it does not use any bridged Objective-C classes. SwiftyHTTP is a demo on how to integrate Swift with raw C APIs. More for stealing Swift coding ideas than for actually using the code in a real project. In most real world Swift apps you have access to Cocoa, use it. res.bodyAsString = "<h2>Always Right, Never Wrong!</h2>"
res.bodyAsString = "Always, almost sometimes." I suggest you start out looking at the SwiftyServer. Also a few - highly inefficient - extensions to convert between String's and CString's. I would love some suggestions on those as well. It also contains the main request/response classes: HTTPRequest and HTTPResponse, both subclasses of HTTPMessage. And enums for HTTP status values (like 💰Required) and request methods (GET etc). HTTPConnectionPool is an abstract base class and manages open connections, either incoming or outgoing. The HTTPConnection sits on top of the SwiftSockets and manages one HTTP connection (it connects the socket to the parser). HTTPServer is the server class. Uses SwiftSockets to listen for incoming connections. See above for a sample. As a bonus - this also has a tiny Connect class - which is modelled after the Node.JS Connect thingy (which in turn is apparently modelled after RoR Rack). It allows you to hook up a set of blocks for request processing, instead of having just a single entry point. Not sure I like that stuff, but it seems to fit into Swift quite well. Find a sample above. use this. Use NSURLSession and companions. Great httpd server - great in counting the requests it got sent. This is not actually serving any files ;-) Comes along as a Cocoa app. Compile it, run it, then connect to it in the browser via http://127.0.0.1:1337/Awesome-O! 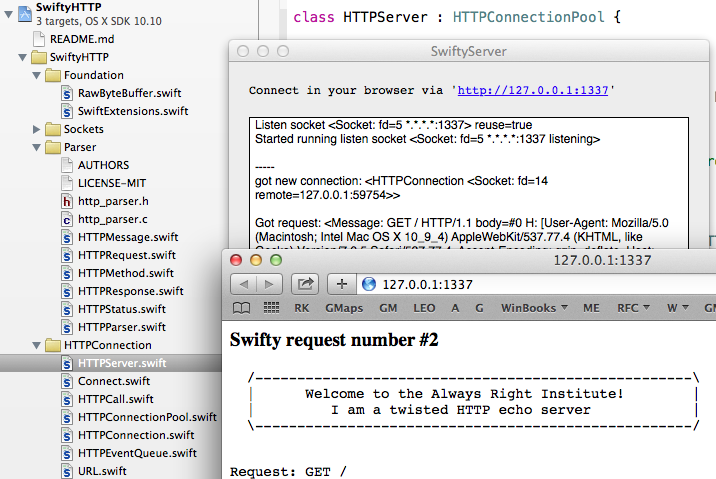 Just a demo on how to do HTTP requests via SwiftyHTTP. No, it doesn't do JSON decoding and such. Again: You do NOT want to use it in a real iOS/OSX app! Use NSURLSession and companions - it gives you plenty of extra features you want to have for realz. 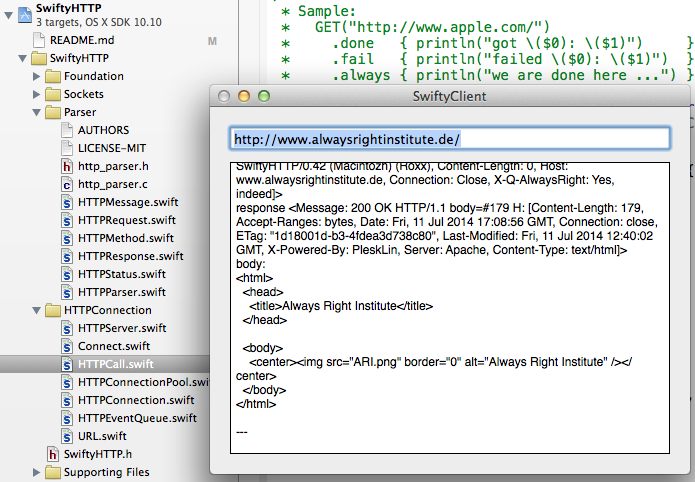 SwiftyHTTP is maintained by AlwaysRightInstitute. This page was generated by GitHub Pages using the Cayman theme by Jason Long.